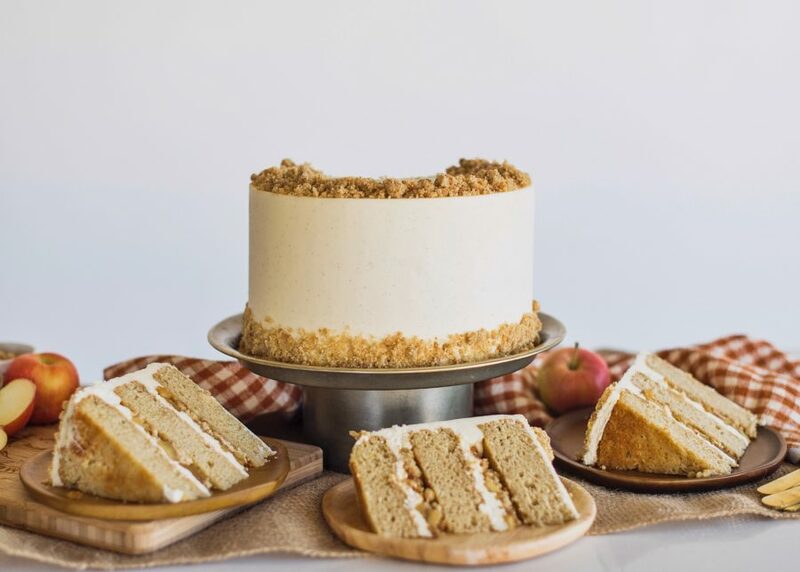 French Apple Pie Cake – apple cider cake layers with shortbread frosting, apple pie filling, streusel crumble and vanilla bean buttercream. Finishing up my Thanksgiving Pie Cake series with my French Apple Pie Cake. Today’s Thanksgiving cake is inspired by my mom’s Apple Pie. She is a master at pies! I remember vividly many occasions in the kitchen by her side learning the art of pie crusts. Her mom taught her, and my mom taught me. I’m sure she cringes a bit every time I talk about my dislike for pie. I loved learning from her, but I never grew to love pie the way she does. Instead or recreating my mom’s pie recipes each Thanksgiving, my new French Apple Pie is my tribute to a women who rolled so much pie dough in her life, it makes my hands ache just thinking about it. So much time and love goes into each pie she makes. So, mom, this one is for you! 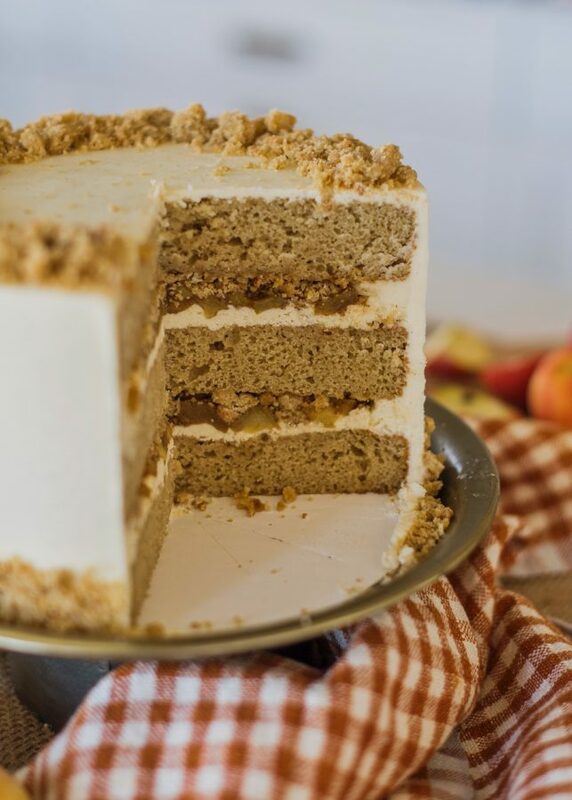 For my apple pie cake, I started with apple cider cake layers. I recommend using a quality brand of apple cider. I actually got mine at Rowley’s Red Barn in Utah. The flavor is incredible and tastes more homemade than I could ever do myself. I think the key in a quality apple cider is that the flavor is much stronger than a cheap store brand version. And flavor is always number one for me. For a pie crust element, I used my shortbread crumbs to make a shortbread frosting (similar to Milk Bar) to include in between my layers. I then topped the shortbread frosting with apple pie filling and a streusel crumble for a little crunch. The cake is then covered in a whipped vanilla bean frosting, which kind of reminds me of the ice cream if you’re having your pie al la mode. 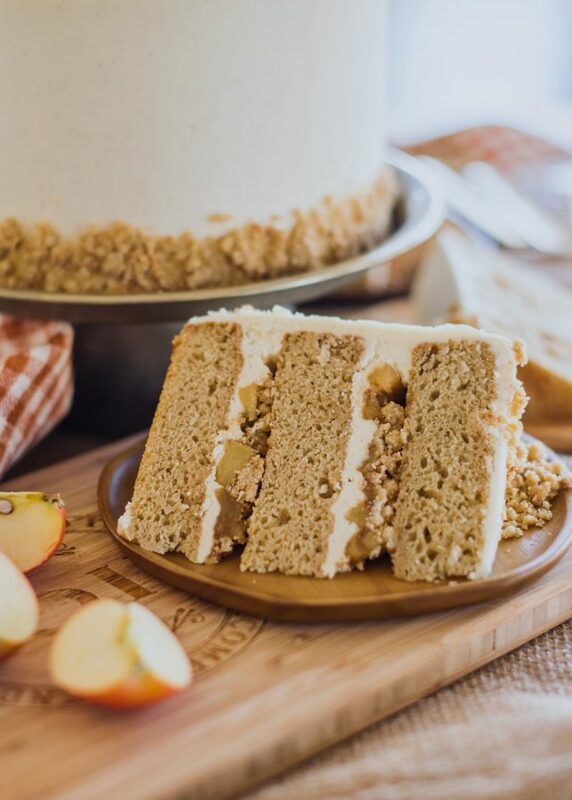 Remember, if you have any left over apple pie filling or streusel (which I’m pretty sure you will), serve a little extra with each slice of cake. 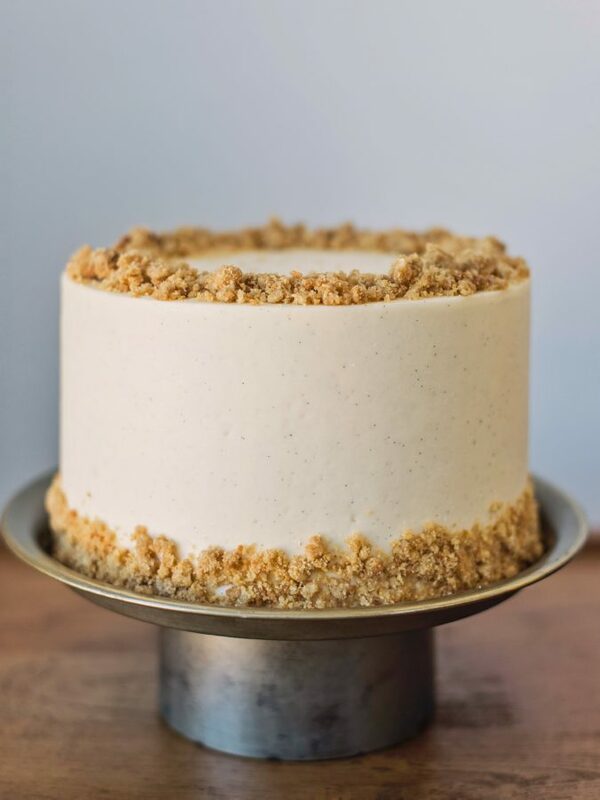 Apple cider cake layers with shortbread frosting, apple pie filling, streusel filling and vanilla bean buttercream. Preheat your oven to 350 degrees F. Spray three 8-inch round pans with nonstick spray, line the bottoms with parchment paper, and spray the parchment. Set aside. In a medium mixing bowl, combine the flour, baking powder, baking soda, salt, cinnamon and nutmeg. Whisk lightly to combine. Set aside. In the small mixing bowl, combine the apple cider, buttermilk and vanilla. Stir to combine. Set aside. In the bowl of an electric mixer fitted with the paddle attachment, combine the butter and sugars. Beat on medium speed for about 2 minutes, until light and fluffy. Gradually add the eggs, beating after each addition. Make sure to scrape down the sides and bottom of your bowl occasionally too. With your mixer on low speed, add 1/3 of the flour mixture, followed by half of the apple cider mixture. Continue to add another 1/3 of the flour, the rest of the wet ingredients and finish with the remaining dry ingredients. Mix until the dry ingredients are incorporated into the wet ingredients. Scrape the sides and bottom of the bowl and mix again on low for another 10 to 20 seconds. Evenly divide all of the batter between the three pans (about 18 ounces of batter in each pan). Bake the cake layers for about 20 to 23 minutes. Let cool for 10 minutes in the cake pans and then invert onto wire baking racks to cool completely. Can be made ahead of time and wrapped separately in plastic wrap and stored in the freezer. Let the cake layers thaw for about an hour before stacking and decorating. Combine the flour and salt in the bowl of a stand mixer fitted with the paddle attachment and paddle on low speed until well mixed. Add the butter and water and beat on low speed until the mixture starts to come together in small clusters. Spread the clusters on a parchment lined sheet pan. Bake for 20 to 25 minutes, breaking them up occasionally and keeping an eye on them toward the 20 minute mark. The crumbs should be golden brown and still slightly moist to the touch at that point; they will dry and harden as they cool. Let the crumbs cool completely before using in a recipe or eating. The crumbs can be stored in an airtight container for 1 week at room temperature or 1 month in the fridge or freezer. Combine the shortbread crumbs and milk in a blender, turn the speed to medium-high, and puree until smooth and homogenous. It will take 1 to 3 minutes (depending on your blender). If the mixture does not catch on your blender blade, turn off the blender, take a small teaspoon, and scrape down the sides of the canister, remembering to scrape under the blade, then try again. In the bowl of a stand mixer fitted with the paddle attachment, combine the butter and powdered sugar. Cream together on medium-high for 2 to 3 minutes, until fluffy and pale yellow. Scrape down the sides of the bowl with a spatula. On low speed, paddle in the contents of the blender. After 1 minute, increase the speed to medium-high and beat for another 2 minutes. Scrape down the sides of the bowl. If the mixture is not a uniform, very pale, barely tan color, give the bowl another scrape-down and another minute of high-speed paddling. Combine the flour and the sugar. Stir until well mixed. Cut in the butter to the flour mixture until small clumps have formed. You can also use your hands to create clusters if you need to. Bake for 10 minutes, stir the mixture, and bake another 5 minutes. Cool completely before using in the cake. Can be made ahead of time and stored in an airtight container in the fridge for 1 week or freezer for about a month. Peel the apples and then cut them into quarter inch chunks. Combine the apples with the butter, brown sugar, cinnamon, and salt in a medium pot. Slowly bring to a boil over medium heat, using a spoon to gently stir the mixture as it heats up and the apples begin to release liquid. Reduce the heat and simmer the apples gently for 3 to 5 minutes. Be careful not to over cook the apples - you’ll get applesauce. Transfer to a container and put in the fridge to cool down. Once completely cooled, the filling can be stored in the fridge in an airtight container for up to 1 week. I wouldn’t recommend freezing this filling. Using a pastry brush, spread some of the caramelized apple juice from the apple filling onto each cake layer. Spread a small dollop of frosting on your cake board. Place the first cake layer on the board, crumb side up. Spread about 3/4 cup shortbread frosting on the cake layer. Make sure to get eye level with the cake to ensure it is level. Using the vanilla frosting, pipe a rim of frosting around the edge of the cake to hold in the apple filling. Spread about 1/2 cup of the apple filling onto the shortbread frosting. You don’t want to add too much filling because it will compromise the structure of your cake. Instead, reserve the remaining filling and serve on the side of each cake slice. Sprinkle about 1/2 cup of the streusel crumble over the apple pie filling. Top with the second cake layer and repeat steps 3 to 6. Place the final cake layer, top side down, on top of the fillings. You'll then spread a thin layer of vanilla frosting around the entire cake to lock in any crumbs. This is called the crumb coat. Freeze the cake for 10 to 15 minutes to ensure the crumbs get locked into this coat of frosting. 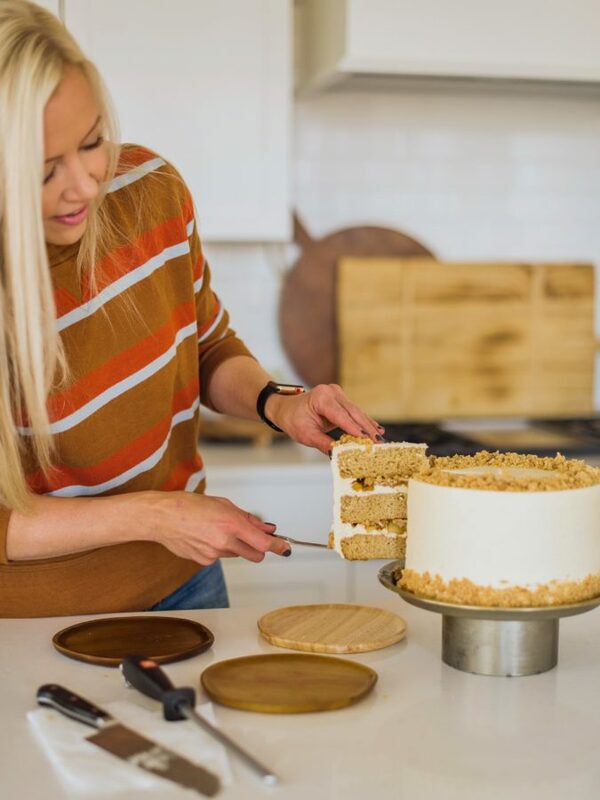 After the frosting is set, continue to frost the cake with the remaining vanilla frosting. 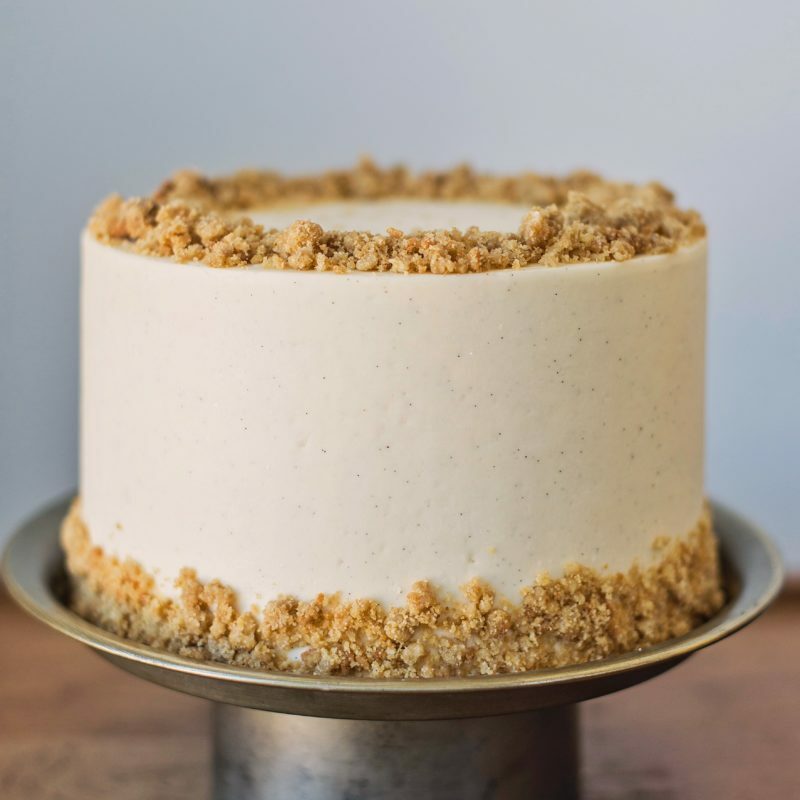 Could you also bake this on a half sheet baking pan and cut out the cake size (hoping to turn this into a 6 inch cake)? You would need to half the recipe or you could do four 6-inch round pans with this full recipe. Is the vanilla bean paste a must or is there a substitute? If it is strongly recommended where to you recommend buying? Thanks, love your cakes! Just made this. Soooooo good!! I got lazy and made a few mods: 2 layers only (cooked longer) and because I didn’t want to drag out my blender I just mixed the shortbread crumbles with the streusel. Next time I’ll try it to spec, but this was still a really amazing cake. The caramelized apple juice soaks into this cake wonderfully. Thank you! Yay! I’m so happy to hear you loved it! Oh no! 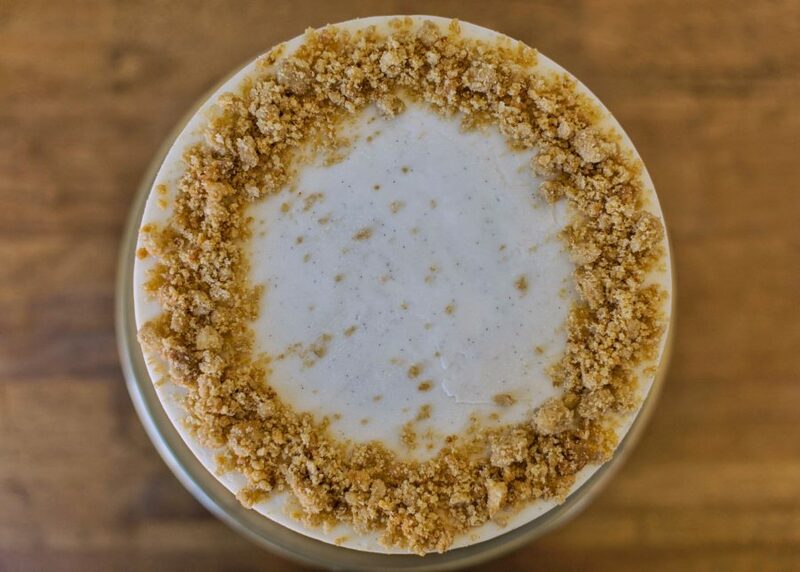 The streusel crumble or the shortbread crumb for the frosting? I’m guessing the streusel? I’m going to adjust the bake time in the recipe. Just the streusel crumble, I should have taken it out after the first 10 min the edges were started to get a little too brown already. The shortbread crumb turned out perfect though!